Welcome to my plot. I’ve been an allotment holder for years and always had the thought of keeping a diary to remind myself when a particular thing was done… of course I never kept the diary going beyond April so it was pretty useless. So for 2018 I thought I’d go one better – I started this blog, and also started an allotment journal, so there’s no excuse to not keep everything updated, right? My allotment is on a north-facing sloping site. We haven’t really terraced the plot, so some beds are more sloping that others. There’s no shelter from trees, the only shadow comes from a neighbour’s shed, and we get our fair share of wildlife coming to visit (and nibble on the produce). Thankfully we don’t have a problem with birds eating the seedlings – for some reason they avoid the allotment site completely, apart from dropping by for a drink out of the water trough on a hot afternoon. Birds are mentioned as a problem in every gardening book I’ve seen…. what they don’t mention is that Roe Deer will happily munch away at strawberry plants, runner bean plants (they particularly like the leaves and shoots)…. in fact most of the things I want to be able to grow! So in order to deter the deer, my allotment has a collection of fleece covers and netting over anything the deer have taken to eating. 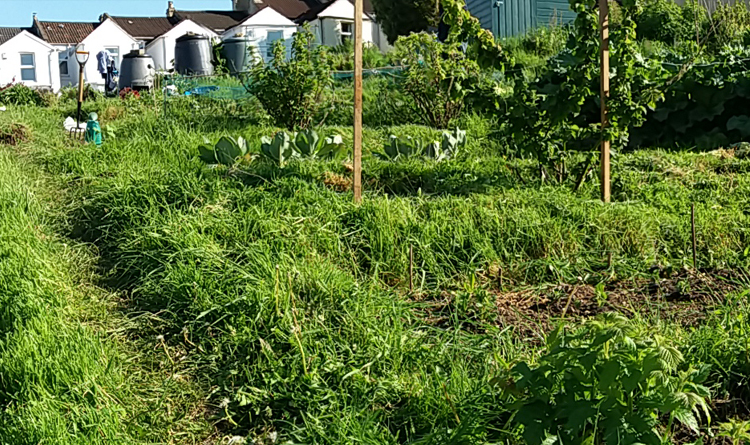 You can usually tell a new allotment plot holder on the site, by the lack of netting. Once they’ve been there a year or so, the nets start to appear! 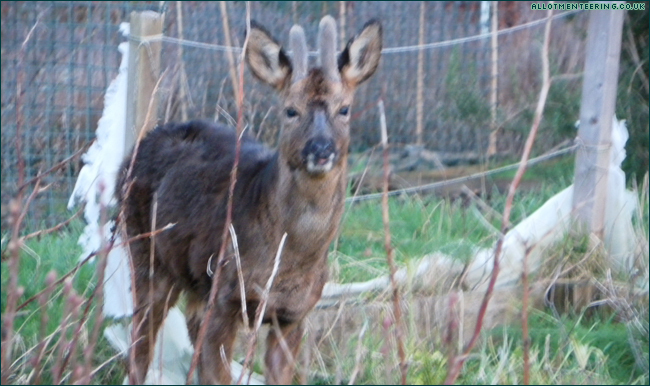 Roe Deer in its winter coat, on the allotment site a few years ago. Despite that, we’ve had some very successful years of growing produce on the allotment, and hopefully this year will be equally good! All I need now is the perfect growing weather, for my plants to thrive. Wondering what all the “Six on Saturday” posts are about? You can blame the Propagator for that! Grab a mug of tea, then head over his Six on Saturday Guide for Participants and maybe even check out this week’s six – all the participant’s links are in the comments of his post for this week.